This poor son of Italian immigrants from the streets of Manhattan’s Lower East Side, grew up to appear in more than 55 films and theatre productions. A brooding, intense actor from the same school as Marlon Brando, he has made a mark in front of and behind the camera. He worked alongside some of the most influential actors and directors in the business. Biagio Anthony Gazzara was born on August 28, 1930. His parents were Sicilian immigrants, and Gazzara was speaking Italian before he learned English. The family lived on East 29th Street, between 1st and 2nd Avenues, and they struggled to get by. Their situation worsened when Gazzara’s father, a roofer and carpenter, died when Ben was still a small child. The tenement they lived in had no heat, and Gazzara recalls how there were mornings where he dreaded getting out of bed because the tile floors were so cold. His escape was always acting. The Madison Square Boys’ Club was across the street from his flat, and it was there that he performed in his first play. He had gone there to see a friend perform, and young Gazzara was made envious by the applause his friend received at the end of the show. He decided he wanted to try it, and the first time he was ever backstage, surrounded by costumes and pancake make up, he was hooked; he knew he had to be an actor. He started performing and became a regular star of the plays the club would put on. As he got older, Gazzara was accepted to Stuyvesant High School, an elite school that specialized in math and science. After two years he returned to Catholic school. He graduated and went on to New York City College, where he studied drama. More and more determined to pursue acting, he attended the Dramatic Workshop, which had previously been attended by Marlon Brando, Walter Matthau, Rod Steiger and Shelley Winters, and like those famous students, Gazzara would go on to study at the prestigious Actors Studio, where the legendary Lee Strasberg was teaching Method techniques. 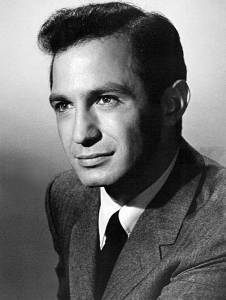 In the 1950s, Gazzara got his break, a Broadway debut, playing Jock de Paris in “End As A Man.” His career became more distinguished with parts in “A Hatful of Rain,” “Who’s Afraid of Virginia Woolfe?,” and “Love Letters.” Gazzara was the first to play Brick in Tennessee William’s “Cat On A Hot Tin Roof.” As the 1950’s became the 1960’s, Gazzara found work in both films and on television. He was cast in bad guy roles early on, perhaps most famously as the defendant represented by Jimmy Stewart in Anatomy Of A Murder. From 1965 to 1968, Gazzara took on one of the roles he is most famous for, that of Paul Bryan in the NBC series Run For Your Life. Conceived by the same writers as The Fugitive, the show concerned a San Francisco lawyer who goes on a routine trip to the doctor, only to find that he has a mysterious disease that the doctors know nothing about, and for which there is no cure. Bryan is told he only has two years to live, and he makes it his mission to live life to the fullest. The show followed Bryan around the globe as he tried to get as much into two years as possible. It posed the existential question to its audience about what exactly it means to live. Gazzara not only acted in the show, but also directed several of its most powerful episodes. In the three years it was on the air, the series received two Emmy nominations for Best Dramatic Series, and Gazzara himself received two for Best Actor. As the years went on, there was more film work for Gazzara, much of it with several big name directors. With John Cassavetes he made Husbands, The Killing of a Chinese Bookie, and Opening Night. There was The Spanish Prisoner with David Mamet, The Big Lebowski with Joel and Ethan Coen, and Summer of Sam with Spike Lee, among others. Most recently, he has been seen on television in the remake of Brian’s Song. These days, Gazzara is based in Italy, where he continues to make movies. Gazzarahas been a cigar smoker for more than thirty years. Prior to that, he had a cigarette habit of four packs a day. A whistle in his bronchial tubes and the release of the Surgeon General’s report about the dangers of smoking made him give up cigarettes in 1963, but the report made no mention of cigars, which he continued to smoke. Gazzara has battled oral cancer as a result. We wish him a speedy recovery and a return to his craft. During a career that spans almost a half-century, Ben Gazzara has given us many memorable characters. We hope there will be many more to come.